Old map by BROWN -Brown's Standards and Flags of all Nations. Title: Brown's Standards and Flags of all Nations. Size: 25.4 x 26.0 inches. Condition: In good condition with muliple original folds flattened. A few folds have been reinforced on the verso. Wide margins. The printed area measures 66 x 64.5 cms the whole sheet 73 x 69 cms. Lithograph by James Brown of Glasgow. 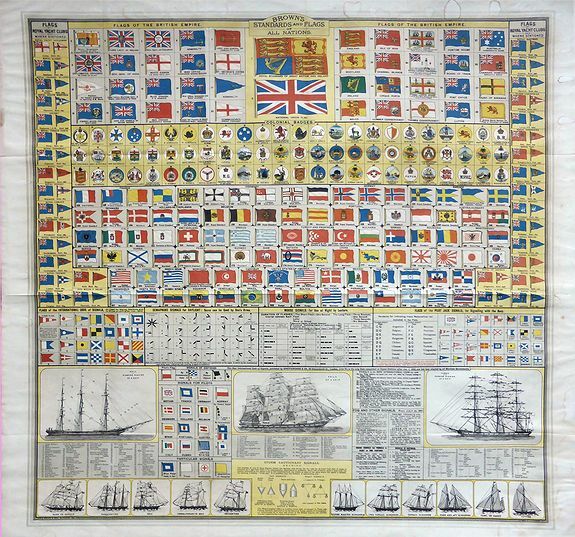 Standards and Flags of all Nations with flags of the British Empire, colonial badges, flags of the Royal Yacht Clubs and pendants, weather signals and diagrams of rigging types of ships with sails.